Posted on April 26, 2018 at 2:10 pm. 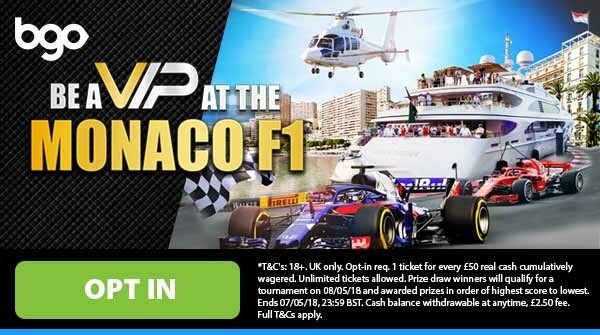 BGO Casino is giving UK players the chance to win over 100 prizes, including a VIP trip to the Monaco Grand Prix. The Monaco Grand Prix will take place on May 26 and 27 and features all the best Formula 1 teams around the world. The atmosphere at the Monaco Grand Prix is electric with over 200,000 people attending over the two days of racing. It will be a real party and especially for you, with a yacht party and sipping champagne at the spectacular Ermanno Palace just some of the perks you will be treated to. Second prize in the promotion will receive £2000 with the rest of the top 10 also receiving cash prizes; while players finishing in the top 100 will receive free spins or bonus money to use at the casino. Remember this promotion is only open to those who reside in the United Kingdom. To enter into the running to win the Monaco Grand Prix Package you need to first join BGO Casino. You then need to opt in and start playing real money games, you will then accrue one ticket into the prize draw for every £50 wagered playing any games. You can continue to earn tickets up until midnight on Monday, May 7. 100 winners will then be drawn to take part in a slots tournament. 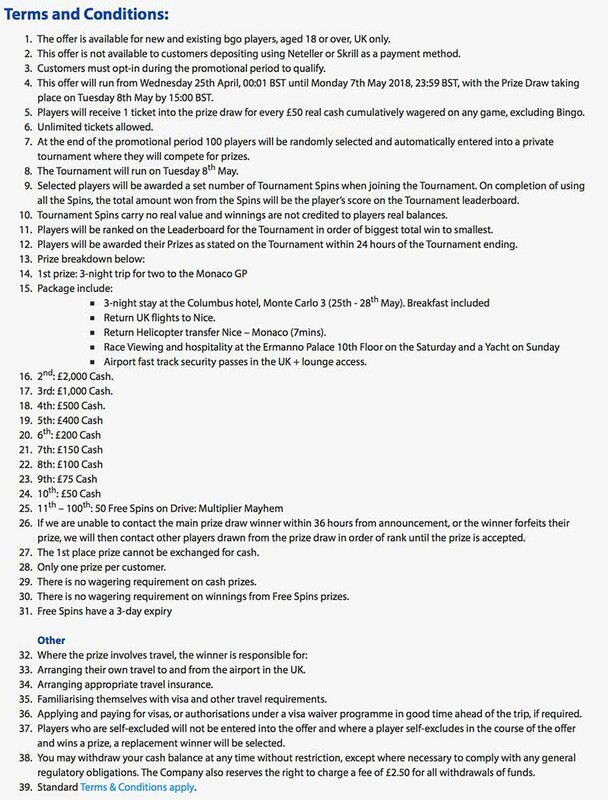 Where you finish in the tournament will then tell you what prize you get, with everyone getting something. Some of the key wagering requirements include only one prize per customer, cash prizes don’t have any wagering requirements and nor does winnings from free spins. New players at BGO Casino can receive up to 50 free spins at BGO Casino. The basic premise is that you deposit up to £50 and receive up to 50 spins. So £1 per spin. *18+. New customers only. 1 Free spin for every £1 of first deposit up to £50. £10 Min Deposit + 2.5% FEE (MIN 50P). 3-day expiry on free spins. Cash balance withdrawable anytime, £2.50 fee. Read the full terms and conditions on the BGO website.